Ten years ago, I shared an apartment with a friend studying veterinary medicine. Sure, she was busy, but we had time most days to sit together on the couch and eat ice cream while watching Jon Stewart on Comedy Central. Sometimes she’d take weekend trips to help a colleague out on a farm, and once she traveled to Thailand for a training exchange. We moved out of that home and on with our own lives, until recently when I sought her out to meet my newly adopted dog. At the clinic, my friend was anything but the lazing, laughing sort. She was calling the shots smoothly and sharply, and all the pets and their owners perked up at her voice. My friend had transformed into an everyday superhero. I was fascinated by her diversity of skills and degree of authority in, what seems to me, a wilderness of diagnoses and treatments. I realized that to work at the interface of human, animal and environmental health means you yourself must also be multi-faceted. What would you do with a knife—and a life—in your hands? Deana Clifford set to the task. She practiced her clinical skills. Looking back, she wishes she had practiced more, to build as much confidence as possible. But at the time, as a student, she realized that some of her classmates were “clinically gifted” and that she “was not one of those” students. Instead of giving up or struggling towards a conventional clinical career, she acknowledged that her research interests were strong. “I came into vet school with an idea that I wanted to do free ranging wildlife population work,” she says. She now serves as a wildlife veterinarian for the California Department of Fish and Wildlife. She still does animal surgeries, to implant transmitters for monitoring and other studies, and admits, “I’m a slow, thorough, scared-to-death surgeon every time I do it.” Could that be because, as a colleague posits, these days Deana is doing surgeries on endangered species like the Amargosa vole? “Somewhere in the back of my mind,” she remembers, “I knew this [was] the right decision if only because it [would] be so interesting and exciting to be there. If that was all I got out of it, that would be fine.” But that wasn’t all she got out of it, not in the least. By openly discussing options with her degree program advisors at UC Davis, she made the most of her trip. She worked on seabirds, sure, and also collected data, met new mentors, and enriched her veterinary expertise with a new perspective from down under. In other words, Christine Johnson, UC Davis Professor of Ecosystem Health, was asking herself, residency or research? She pursued the latter, a Ph.D., in veterinary school and gained a very specialized skill set. 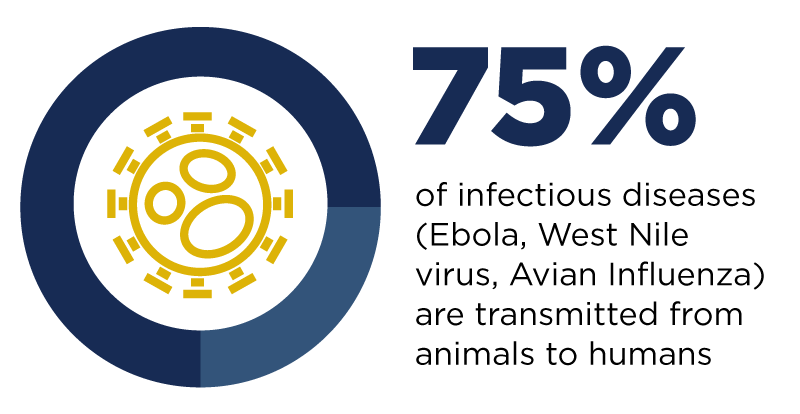 This information is adapted from an article and video series in the Evotis newsletter published by the UC Davis One Health Institute. Students for One Health serves local communities and engages worldwide with clinics and knowledge exchange. The Global Disease Biology Major for UC Davis undergraduates explores the science behind discoveries, causes, evolution, diagnosis, treatment and prevention of diseases.